June is an exciting month for many summer events. School is out for summer, blushing brides are preparing to walk down the aisle, swimming pools open, and families hit the roads for vacations. Unfortunately, not everything about June is wonderful. forecasters this will hopefully be a slower than usual season. They are predicting eight to thirteen tropical storms and three to six hurricanes. Of course, there is no way to tell whether any of these potential storms will strike the U.S. coastline. Living in Louisiana, we are used to hurricane watches and warnings. It seems that we sit on pins and needles at least once every summer watching the weather forecast. We live at the top of the state, so we usually don’t get the same impact as our neighbors further south. Hurricane Katrina nearly wiped New Orleans off the map in 2005. We watched in horror as families were left stranded on rooftops or crowded into the Super Dome. In the aftermath of the devastation, the high school where I was working received hundreds of students who had been displaced. Many were still missing family members and most had no idea what had become of their pets. I have very strong opinions on the government reaction to that storm. I tend to climb on a soapbox and rant on this subject, so let’s just move on from there. More recently, Hurricane Sandy slowly worked its way up the East Coast before hitting New Jersey and New York in late October of 2012. Although the government’s response was vastly improved compared to Hurricane Katrina, it was still a devastating storm. pets. Many people refused to evacuate to shelters, because they couldn’t bring their dogs or cats with them. According to a paper published by the University of Colorado-No Place Like Home: Pet-to-Family Reunification AfterDisaster - after Hurricane Katrina more than 200,000 pets were displaced. A staggering 95% were never reunited with their families. I watched news reports where the survivors were more upset over the loss of their pet than their home. At the 2014 BlogPaws conference, the great people from Hill’s Pet Nutrition held a session on Disaster Preparedness. Now is the time to prepare for this season’s hurricanes. Here are seven tips to help ensure your pet’s safety. 1. Make sure your pet can be identified by either a microchip or collar ID tag and make sure the information is current. 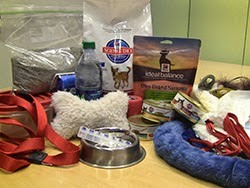 book; a 3-day supply of pet food in a waterproof container and bottled water; a safety harness and leash; waste clean-up supplies; medications and medical records; a contact list of veterinarian and pet care organizations; information on your pet’s feeding routine and any behavioral issues, comfort toys; and a blanket. 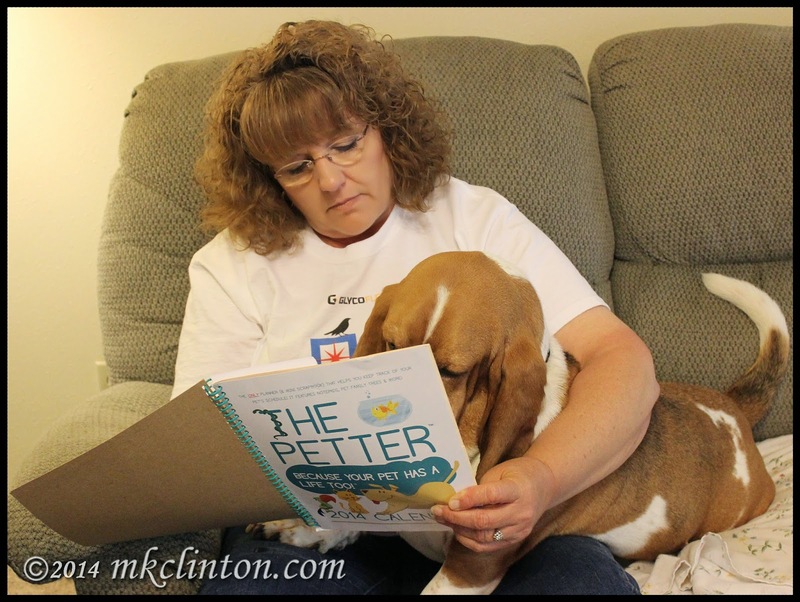 *The Petter is a great notebook to store all of this information. 3. Display a pet rescue decal on your front door or window to let the first responders know there is a pet in the house. Include your vet’s contact information. *You can receive a free decal from the ASPCA. 4. Know where you pet likes to hide in your house when they are frightened. You will need to be able to find them quickly in the event of an evacuation. 5. Have a location to take your pet if you need to leave your immediate area. Many disaster shelters for people do not accept pets. Check hotels for pet-friendly policies or ask family or friends away from the storm area if you and your pets are welcome to take shelter with them. 6. Be sure to have an up-to-date photograph of your pet in the event that you are separated. 7. Consider taking a pet carrier or crate if possible to transport your best friend. hurricane storm watches and warnings are issued. The network is prepared to respond quickly with shipments of pet food to communities impacted by disaster. 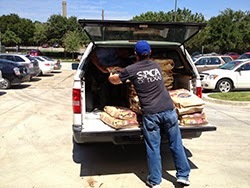 In 2013, the Hill’s Disaster Relief Network delivered free pet food to twelve disaster areas throughout the United States. That is the way to be awesome Hill’s! In recent years, many people along the coastal areas have become complacent in reacting to storm warnings. The mindset of “It won’t happen to me.” is foolish. Nobody is invincible and as the saying goes, “You can’t fight Mother Nature.” Please don’t delay when storm warnings are issued. It could prove to be deadly to you and your pets. For more information on how to keep your entire family together in the event of an emergency, here are some helpful links. Thank you to Hill’s Pet Nutrition for providing this helpful session and handouts. It is wonderful to know that a pet company goes above and beyond to keep our four-legged family members healthy and safe. Great post. Hopefully none of you will have to deal with it. Have a lovely week. Thank you. I am hoping that we don't have to deal with any this year. Thankfully, we don't have hurricanes here, but we have tornadoes. All those nasty, natural storms are so scary and losing or missing a pet during one would be so scary for us pets and for our humans. Great post! Bentley, stick with your mom if there are storms! Storms can be very scary. We had a tree fall in the yard last year from a neighbor's backyard. Bentley is a second skin to me during storms. What great information, thank you for sharing it all with us. I hope all goes well this season and no hurricane disasters. My co -worker adopted a katrina dog. Unfortunately she is no longer with us but she had a great life. We don't have any hurricanes here, thank dog. That stuff scares me to the max! You gave some great tips! And I thank you for helping to educate on the subject of being prepared! We have all huddled in the hall before. I'm not a fan of scary storms and Bentley hates them! No hurricanes over here. Infact the UK has no extreme weather. Methinks we are very lucky. Have a marvellous Monday. Wow! You are very lucky. We don't have hurricanes or tornadoes in California, but earthquakes are a worry with all the fault lines running under us. And we have had many homes that had to be evacuated because of wildfires. So I guess there is no place to escape the wrath of nature. Thanks for the reminder to avoid the "it can't happen to me" mindset and do a little more preparation for an emergency. I;m sure that earthquakes are just as frightening. The wildfires out west are crazy scary! We have earthquakes here. I need to figure out what we're going to feed Mr. N in an emergency because he refuses to eat freeze-dried food or kibble. Maybe some canned food with a pull top work. Fortunately, the DC metro area doesn't take direct hits from hurricanes! We get the winds and the Potomac River, being tidal, can suffer a storm surge, but in general we are safe. However, your info is valid for any emergency evacuation, whatever the cause. Thanks Taryn! Some of those storm surges are really bad. It is always best to be prepared. No hurricanes in Iowa, but this post was SUPER helpful for the nasty tornadoes we tend to have in this area! Thank you for sharing these tips! What an informative post! We have the same type of kit in case of an earthquake!! Great tips - luckily we don't get hurricanes out here...just the opposite droughts & fires. Great tips to be prepared. We live in Florida and I am stocking the hurricane box this week. We are very close to the coast (about two miles) so we usually leave home at least once a year. I just grab the dogs, our hurricane boxes and we go to a hotel out of the path till it passes.